1980 Birds. The SG catalogue value of this set is £12. Ruanda MiNr. Land: Ruanda. Motiv: UPU. Fehlen Ihnen noch Binder von Leuchtturm, Kabe, Lindner oder Safe???. 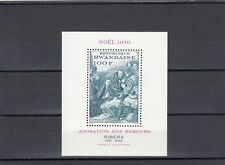 (Rwanda 1988 Primates of Nyungwe Forest - Mint Never Hinged (MNH). (10F) - Dwarf Galago. (3F) - Black-and-white Colobus Monkey. Set of 4 values (4v Set) You will be back for more! 3) Select each item and 'Add to Basket'. SG401 20c, Pope John XXIII. Total of 1 stamp. :- The item you receive may not be the item scanned, but will be of similar quality. No Exclusions. Date of issue: 20 March 1972. You think price is not right?. Condition: Mint Never Hinged. Akagera National Park. :- The item you receive may not be the item scanned, but will be of similar quality. No Exclusions. Date of issue: 26 November 1984. If it is an error on my part (don't like making mistakes but I do), I will admit to this and again do my best to work it out with you. :- The item you receive may not be the item scanned, but will be of similar quality. Stanley Gibbons No. : 1049-1056. No Exclusions. (Dies ist kein Muster, Sie erhalten exakt die abgebildeten Marken. This is no sample, you get exactly what you see. sr2640) Mi. Vous recevrez les timbres que vous voyez. Rwanda - Ruanda. Condition: MNH. Scans are provided for a reason. 1994, Sierra Leone, 2171-74 U, . Bei gestempelten Ausgaben kann auch die Abstempelung variieren. Der angegebene Preis ist ein Endpreis zzgl. 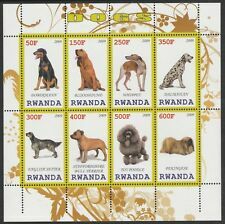 Rwanda - Mint & used collection on stockcards. See pics below. See pics below. Any problems WILL be an honest mistake and I will be happy to resolve it! We appreciate your cooperation with this. Delays can occur. Yes we do. We will combine over a 2 week period. COMBINING ORDERS. NEW POLICY EFFECTIVE FEB 6, 2019. Direct communication is always the best way to fix an issue. (Set of 8 values (8v Set): 20c, 30c, 50c, 1F, 6F, 18F, 30F, 44F. You will be back for more! 3) Select each item and 'Add to Basket'. :- The item you receive may not be the item scanned, but will be of similar quality. -:-~~~~~-:-. Stanley Gibbons No. : 1297-1301. No Exclusions. (Dies ist kein Muster, Sie erhalten exakt die abgebildeten Marken. This is no sample, you get exactly what you see. sr2639) Mi. Vous recevrez les timbres que vous voyez. :- The item you receive may not be the item scanned, but will be of similar quality. Date of issue: 22 March 1976. No Exclusions. Condition: Mint Never Hinged. :- The item you receive may not be the item scanned, but will be of similar quality. No Exclusions. You think price is not right?. Date of issue: 23 October 1972. Condition: Mint Never Hinged. Stanley Gibbons No. : 562. Scott No. : 540. You think price is not right?. -:- The item you receive may not be the item scanned, but will be of similar quality. No Exclusions. Date of issue: 12 September 1973.